SNAFU! : Can Bell finally give us that mythical tilt rotor gunship? Can Bell finally give us that mythical tilt rotor gunship? I've been monitoring the conversation with regard to the X2 and its ability to fulfill the recon role (but lets be honest this is all leading up to a light attack role...everything is kinetic these days) and it made me wonder. Can Bell finally deliver a tilt rotor gunship? 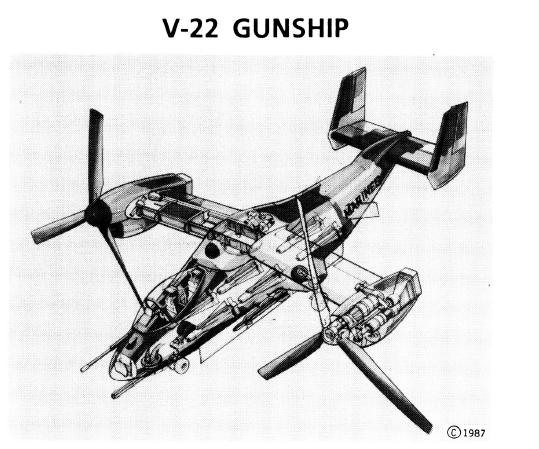 Some of you might not remember this but part of the plan when the MV-22 was first introduced was to not only give it a VIABLE self protection capability but also to pair it with a tilt rotor gunship that could keep up with it and deliver the same type of firepower as an AH-1W (at the time our bird of choice) attack helicopter. As you can see above, plans were drawn up and from my chair it seemed doable. As a matter of fact they were claiming commonality with the MV-22 so the thing should have been a rocket on steroids. The engine power alone, powering a much lighter airframe, should have had the thing pushing speeds that would make eyes water. Is it time to revisit the concept instead of pushing for an unmanned solution? I'm biased but I think so.